The evaluation of airway pressure tracings during complete airway occlusion provides interesting functional data for weaning patients from mechanical ventilation. The occlusion manoeuvre may be achieved either by maintaining occlusion for a prolonged period during maximal inspiratory effort (PiMax) or for a shorter time period (200–300 ms). The inspiratory depression of airways pressure, achieved after 100 ms of occlusion, is generally defined as the occlusion pressure or P0.1 and represents a valid indirect measurement of the activity of the respiratory centres. P0.1 is a reliable measurement of the intensity of the stimuli from the neurological centres to the peripheral respiratory muscles [1,2]. Whitelaw et al elegantly demonstrated the reliability of this measurement  in human healthy volunteers spontaneously breathing at rest and during hypercapnic challenge. P0.1 can represent a more precise respiratory drive measurement than other measurements such as tidal volume, respiratory rate, minute ventilation or mean inspiratory flow (VT/Ti) since it is relatively independent of modification by respiration machines. The aim of this article is to analyse the technical aspects relating to the acquisition of occlusion pressures, taking into account the possible bias represented by specific physiopathologic situations and to define some future uses of P0.1 during weaning procedures. A complete review of the literature dedicated to P0.1 measurement in different clinical settings has been recently published . P0.1 can be easily measured at the bedside in both poorly co-operative or mechanically ventilated patients. When first used in non-intubated patients, this measurement required the separation of inspiration flow from expiration flow since the system allowed the selective occlusion of the inspiratory line during exhalation. The subject started to inhale against a closed inspiratory line, resulting in a depression that was easily recorded with an air-filled pressure transducer connected to an high speed recorder; P0.1 could be easily measured and airway pressure changes could be precisely monitored in the first 100 ms from the onset of inspiration. The occlusion manoeuvre can be both manually or electrically powered, but must be noise-free to prevent breathing modification by the patient . The technical requirements for P0.1 are shown in Table 1. Measurement at 100 ms has been chosen since it was demonstrated that a normal subject requires at least 150 ms to sense the occlusion and react against it . The interference due to mouth compliance has, in part, been considered negligible, although this aspect has not been fully studied. In mechanically-ventilated patients, P0.1 can be easily measured by inserting a shutter in the ventilator's inspiratory line, as near as possible to the patient, and recording airway pressure tracing at the Y piece [4,5,6] (Table 2). However, in patients ventilated using assist-control or pressure-support ventilation it is possible to use the demand valve system's prolonged time of response to obtain P0.1 breath-by-breath measurement in conditions of quasi-occlusion. This measurement was proposed by Taylor et al in 1975 in healthy volunteers connected to an assist-control circuit. Since the time of response of the demand valve takes longer than 200–300 ms before the inspiratory valve opens the flow, a phase of inspiration can be observed against a sort of shutter . The reliability of this non-invasive measurement has been well confirmed by Fernandez et al  in patients mechanically ventilated in control mode with a sensitive trigger. We have recently observed a good correlation between the values of P0.1 measured with the formal occlusion technique and P0.1t (the value computed by observing the airway pressure change due to the inspiration against a closed demand valve ). In that study all patients had variable levels of intrinsic positive end-expiratory pressure (PEEPi). The problem of the reliability of P0.1 measurements in patients with PEEPi is crucial. In these subjects an important time gradient between the onset of inspiratiory depression at the alveolar level (ie oesophageal pressure) and the attainment of airways opening pressure was observed . In other words, the measurement of the inspiratory compensation of the pressure gradient represented by PEEPi was both work- and time-consuming. In order to evaluate P0.1 in patients with PEEPi during pressure-support ventilation, we compared the values of the occlusion pressure obtained from the airway (Paw) and oesophageal pressure (Poeso) tracings by studying both the depression from the baseline and the behaviour of the two signals over time  (Fig 1). In these conditions we could confirm the presence of a time delay of 137 ± 88 ms in patients with PEEPi values below 7 cmH2O. This delay reached 219 ± 130 ms in patients with PEEPi levels over 7 cmH2O. Thus, due to the level of PEEPi, what is considered as P0.1 from airway pressure tracings is in fact a value in the range of P0.1–0.15 and sometimes P0.2–0.25. 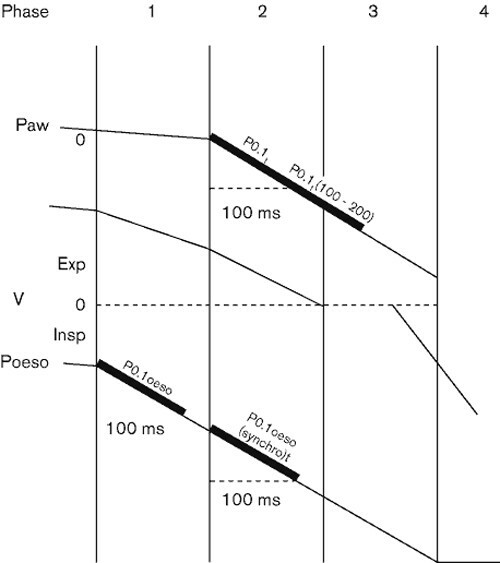 However a close correlation appears when the values of occlusion pressure obtained between 0 and 100 ms and between 100 and 200 ms without formal occlusion are compared to those values of P0.1 calculated from Paw and Poeso tracings obtained with standard occlusion techniques. We may also conclude that P0.1 represents a reliable measure of inspiratory drive in patients with chronic obstructive pulmonary disease (COPD) with PEEPi and dynamic hyperinflation, measured both by the formal occlusion technique and by the simplified measurement proposed by Fernandez et al. More recently, Brenner et al developed an automatic system to determine P0.1, interfacing a standard ventilator to a personal computer ; with this apparatus they were able to obtain accurate and non-invasive P0.1 measurements. Nowadays P0.1 can be easily measured and can be incorporated into the software of ventilators and devices for monitoring lung mechanics. Schematic representation of airway pressure (Paw) and oesophageal pressure (Poeso) and airflow (V) modifications during triggered inspiratory breathing. There is a consistent time delay between the onset of Poeso and Paw deflection and the moment when the expiratory flow reaches zero. During mechanically assisted breathing an important part of the inspiratory effort is used, in the presence of PEEPi, to reset the alveolar pressure and to stop expiratory flow. Many clinical and functional tests have been proposed to predict successful weaning both in patients with acute respiratory failure or acute exacerbation of COPD. These tests generally include parameters of inspiratory muscle strength (PiMax, vital capacity), respiratory endurance (maximum voluntary ventilation), respiratory pattern and blood gases. However, a majority of COPD patients fulfilling the weaning criteria fail the weaning trial. Sassoon and colleagues in 1987  compared the traditional parameters with P0.1 measurement in COPD patients, observing the superiority of this variable in terms of individual prediction of successful weaning. In this study the authors observed a precise cut-off of P0.1 at 6 cmH2O. This cut-off identified all the patients that could be easily weaned. PiMax and vital capacity (VC) were significantly different between weaned and unweaned patients, but failed to identify individual weaning success; respiratory pattern analysis was also unpredictive. These data are consistent with the observation of Murciano et al , who found high values of P0.1 in the first day of exacerbation in a group of COPD patients requiring mechanical ventilation. These values rapidly returned to normal just before extubation in successfully weaned patients, but never reached normal values for those individuals requiring reintubation within 2 or 6 days. Montgomery and co-workers  evaluated the predictability of P0.1 after a hypercapnic challenge in patients who were assessed as `difficult to be weaned'. The authors started from the assumption that P0.1 `basal' value could be erroneously low due to the presence of respiratory muscle fatigue and therefore required a hypercapnic stimulus in order to evaluate the inspiratory muscle functional reserve. An increase of 10 mmHg in end tidal CO2 (ETCO2) produced a much higher increase of P0.1 in patients successfully weaned than in patients who were unsuccessfully weaned . Herrera et al observed high values of P0.1 in a group of active respiratory failure (ARF) patients . Interestingly the level of P0.1 slowly decreased while the condition of the patients improved, although minute ventilation and respiratory rate remained constant. This behaviour was explained by the authors as a result of the presence, at least in the initial phase, of inspiratory muscle fatigue which limited the peripheral response to the central drive signals. We recently compared the values of P0.1 to some currently used weaning parameters [PiMax, VC, respiratory rate (RR), tidal volume (VT), blood gases, Ti/Ttot] in a group of COPD patients after 30 min pressure support ventilation, with the aim of detecting early predictors of weaning during pressure support ventilation (PSV) . Although PiMax, VC and P0.1 were significantly different between successful and failing patients, only P0.1 could predict successful weaning, with a precise cut-off level at 4.5 cmH2O. In this study the breathing pattern analysis and mean inspiratory flow value (VT/Ti) were also unpredictive, probably due to the high level of pressure support used (20 cmH2O); moreover for each ventilated patient in control mode a clear-cut correlation was observed between the P0.1 and PEEPi immediately before weaning was started. An interesting approach to try to link the measurement of respiratory drive (ventilatory demand) and functional reserve of the respiratory muscles into a single variable has been recently proposed by Fernandez et al . These authors suggested the use of P0.1/PiMax ratio as an index which can theoretically correct values of P0.1 which are erroneously low due to the presence of respiratory muscle fatigue. The authors evaluated a group of 50 subjects divided into five subgroups of different respiratory illness severity [from healthy volunteers to intensive care unit (ICU) patients requiring full mechanical support]. No correlation between P0.1 and PiMax was observed, but P0.1/PiMax index increased the reliability of P0.1 in detecting the need for mechanical support. Recently, many integrated weaning indexes have been proposed for clinical use, but few provide comparative data with P0.1. However, there is convincing evidence that P0.1 represents an interesting variable for the clinical management of patients during weaning. The possibility of obtaining a valid measurement with a simple, non-invasive procedure and without interruption of the natural breathing rhythm is awaited with interest. From the first report of the use of P0.1 as an indirect way of measuring respiratory drive  in non-intubated patients, this index gained popularity, extending its use in mechanically ventilated patients, especially during weaning phases. The availability of software to automatically measure P0.1 using digitised signals from standard ventilators  has contributed to the importance of P0.1 in the analysis of the decisional algorithm of mechanically ventilated patients. Further interest for this measurement derives from its correlation with the inspiratory work of breathing. Olivei and co-workers recently published the first data obtained with a new method of P0.1 breath-by-breath measurement during PSV . This measurement was obtained by extrapolating the phase of proto-inspiratory depression from 66 to 100 ms, starting from when the flow signal passes zero. In this way the authors showed that it was possible to obtain non-invasive continuous P0.1 measurement in patients connected to machines and to provide a fast response to their inspiratory demand (≤ 100 ms). Moreover this study showed a positive correlation between the work of breathing (WOB) litre of ventilation and the WOB minute (r + 0.86 and 0.90, respectively)  suggesting that P0.1 is reliable not only as a parameter of central drive but also as the respiratory impedance reflex during assisted inspiration. More recently Iotti et al validated a system of PSV closedloop control of pressure support ventilation, based on automatic P0.1 acquisition . These data suggest possible future applications of continuous automatic P0.1 measurement to correct the level of respiratory support in patients under assisted ventilation. MIP or PiMax can be defined as the maximum pressure generated during inspiration against an occluded airway and this has been demonstrated to be an effective evaluation of inspiratory muscle strength , provided that the lung volume is known at the time of the measurement. It is, in fact, important to remember that the maximum force generated by the inspiratory muscles is closely related to the degree of muscular stretching. MIP is usually measured after a forced expiration to residual volume , but some authors suggest measuring MIP at the point of functional residual capacity (FRC), in order to mimic spontaneous ventilation. The advantages and disadvantages of the different methods of measuring MIP are discussed in Table 3. Some differences exist between authors [20,21] concerning normal MIP values; it is generally accepted, however, that adult males have values of 115 ± 27 cmH2O, and women have 25% lower values. MIP tends to decline with age, with a 20% reduction after 70 years. MIP evaluation is usually simple and reliable in co-operative patients; however, it cannot be easily measured in critically ill patients who are being mechanically ventilated for acute respiratory failure. A specific technique for MIP assessment in this situation has been proposed  (Fig 2). Patients can exhale after each inspiratory effort keeping the expiratory line open and the inspiratory line occluded for approximately 20 s and progressively achieving the residual volume and stimulating maximum drive levels. When a `plateau' value is obtained during two or three consecutive inspirations, this value is considered the MIP. The method described by Truwit and Marini  seems particularly interesting in patients with reduced central drive levels. Determination of maximum inspiratory pressures in a non-cooperative patient. The manoeuvre was assessed by maintaining the occlusion of the inspiratory line. Paw = airway pressure. MIP has been mainly used in a clinical setting to evaluate the respiratory effects of neuromuscular disease and to assess weaning possibilities. MIP monitoring has been used during polymyositis and dermatomyositis to evaluate progression toward respiratory failure , or to assess inspiratory muscle strength after unilateral diaphragmatic paralysis . MIP has also been considered a good `weaning predictor'. In 1973 Sahn and Lakshminaraian described MIP values of 30 cmH2O as efficient individual predictors of weaning . However, more recent studies have shown that MIP is much less reliable when used as the only predictor of weaning, and should always be considered in conjunction with other variables [6,11]. Finally, MIP values, used in conjunction with P0.1 measurement, have been proposed as a new index (P0.1/MIP) for increasing the specificity and sensibility of P0.1 to determine whether patients require artificial ventilatory support or can breathe spontaneously . In conclusion, MIP is easy to measure, and reflects inspiratory muscle strength. However, several drawbacks reduce its clinical applicability as a unique variable of reference, and we recommend its use in conjunction with other variables, such as P0.1 measurement, respiratory pattern or gas exchange.